I spent a few minutes on Twitter today tweeting out some figures and links relevant to this issue of non-work among prime-age adults (25-54 year olds). The issue is getting a ton of attention, well-deserved, for sure, but why now (this NYT survey provides a useful summary, though as Dean Baker points out, women’s employment rates have also declined of late)? 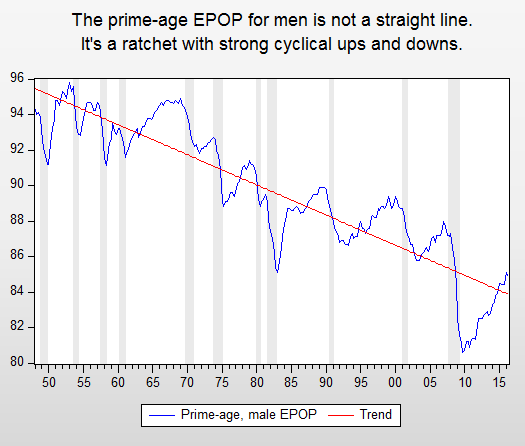 After all, the negative trend for men (see fig 3 below) is long-term. Clearly, one explanation relates to the the election and the belief that much of Trump’s support comes from non-college educated white guys disconnected from the job market. 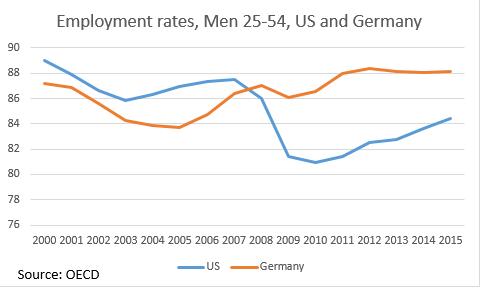 What’s important about the first two figures is that the German labor market has been hit with the same two factors typically raised to explain the increase in non-work: globalization and technology. 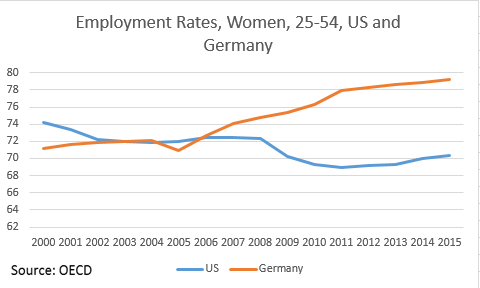 Why have German prime-age men and women fared so much better than those in the US? –Much more union coverage, and German unions work with both management and government to support employment through apprenticeships, training programs, and export-oriented manufacturing policies. –This last bit is supported by their undervalued currency; as the strong man in the eurozone, the German currency would rise if it could float. As it is, their current account surplus is a whopping 8% of GDP, meaning they’re essentially importing labor demand from weaker eurozone economies. –They’re just more “we’re-in-this-together” when it comes to labor market policies. One reason their employment rates didn’t tank in the recession was because workers essentially shared the problem of weak labor demand: instead of concentrated layoffs, broad swaths of workers took reduced hours with part of their lost earnings replaced through gov’t support. Our unemployment insurance system actually offers that option, but it’s way underutilized. The reason for manufacturing’s anemic performance is that U.S. consumers and businesses are buying more imported products, and American exports have not risen commensurately. Instead of manufacturing their products in the United States and exporting them to foreign markets, U.S. multinational companies now often locate production overseas to take advantage of lower labor costs and taxes, among other factors. I say before we go to the shaming place, let’s get the policy right. The third figure shows a clear cyclical response to ups and down in job opportunities around the negative trend, and here I show that the cyclical responsiveness has increased over time. That makes sense to me, given that our welfare system has shifted more towards in-work benefits. While disability insurance often gets raised in this context, the highly regarded CEA report on this topic assigned less than 10% of the decline in prime-age male work to the disability rolls. No question, “agency,” or personal responsibility, is always in play, but from where I sit, the evidence of jobs leaving workers is more persuasive than that of workers leaving jobs. Share the post "More on the non-mystery of non-work: Germany v. US"
4 comments in reply to "More on the non-mystery of non-work: Germany v. US"
You leave out the part about how difficult or near impossible it would be for a German company to close a factory to relocate in Poland for cheaper wages. You leave out the fact in Germany there is no at will employment, workers are nearly impossible to fire. This makes companies hesitant to make new hires, but also means they have a greater incentive to hold the current workforce. They don’t look forward to the next slowdown to get rid of dead wood, impossible if dictated by seniority, and replacing them is fraught with the peril of getting stuck with worse. You leave out the fact the percent of labor costs in the price of manufacturing today is so small (below 15% for cars) that labor premiums are a small penalty, especially when engineering quality drives exports. German self-imposed austerity is wrong, and Euro wide austerity influence is wrong, but just what country has proposed increased deficit spending? Only the U.S. at $160 billion, which is less than 1% of GDP, an election year compromise and necessity. Imagine our economy without it, or the oil glut bonus. The downside of Germany is the middle school test that determines your future too early, but Americans fool themselves about equal opportunity here. Again for emphasis, labor rights are mandated by federal law, which leads to labor union power, not the other way around. The history of the United States is similar, 40 hour work week, end of child labor, it’s the law, legislated, not negotiated. Union organizing doesn’t work, strikes and boycotts outlawed by Taft Hartley do. And the R’s actively oppose German style union-company cooperation. Was it Tennessee where a German car company wanted to setup production with German style union cooperation and the state did not allow it? Of course Germany wants everyone to run a trade surplus, so they cannot be copied in regard to that. I would also guess that German consumers don’t buy cheap junk like Americans do. We have these large houses that need lots of repairs by the time they are 25 years old. Is a diff of 4%, *across countries* really significant ? Although you’ve drawn a straight trend line beginning in 1950, the trend for 1950-1970 is more or less straight, and the negative trend is actually from 1970 to 2015. Nixon’s War on Drugs began in 1970. In that year, there were about 400,000 people incarcerated in American prisons and jails, almost all of them male – a figure that had grown more or less in line with population growth for the prior half-century. Beginning in 1970, the number of people incarcerated began to grow at rate that far outstripped population growth, and today there are 2.3 million incarcerated Americans. Obviously, incarcerated people cannot work. In addition, people with criminal records find it very difficult to obtain legal employment. I would think that when you are looking for reasons that an increasing number of men 25-54 are not working, the first place to look is at the percentage of such men who are incarcerated or have criminal records due to the War on Drugs.